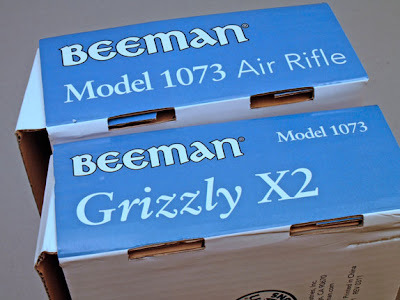 Archer on Airguns: So when is a Beeman Model 1073 a Grizzly X2? I'm also pretty excited,purchased a Grizzly X2 from Walmart. Rifle is a little on the heavy side, but that I like, and is fairly loud. Overall solid rifle so far. Bought this rifle at wal-mart intending to give it a try out and likely return it. I have owned several similar rifles in years past and all had major issues. Either they were to weak, or couldn't hit squat. I was further concerned with the many blogs bashing these guns a chinese "cheapo". Well, 2 days and about 200 pellets later, i think this gun has found a new home. The accuracy is scary, right out of the box. There is no question it has plenty of power, leaving a serious dent in a washing maching at 100 yards! This was while using the .177 barrel and only compensating a few inches for drop. The only thing negetive about the gunn so far are the plastic sights, that do appear a bit fragile. All in all, this is one heck of a gun for the price. If you have a extra 500 bones to piss away, im sure the fancy German rifles are great, but if you want the best bang for the buck, give one of these a try, doubt you will be in the returns line anytime soon.